Sanctuary candles continue the time-honored tradition of recognizing Christ’s eternal presence in the church. Angel Direct offers sanctuary candles for all liturgies and budgets, including beeswax and paraffin-based; glass and plastic vessels; 7-day, 8-day and 14-day burn times; and bottleneck or open-mouth styles. Use Angel Direct’s “Shop By” filters on left side to easily shop for sanctuary candles by burn time, wax type, vessel type, brand and price, and see sanctuary candle pages below for additional product information. 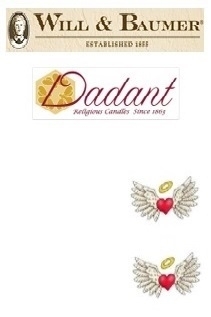 AD Heavenly ValueTM - Compare Angel Direct’s price below for Dadant Candle 7-day glass (case of 12) and 7-day plastic-sleeve (case of 24) sanctuary candles to what you’re currently paying for your 7-day sanctuary candles. AD Heavenly ValueTM – Before placing your order, use Angel Direct’s shipping estimator (add product to cart, then select “View All”) to see our unbeatable UPS Ground shipping rates on all sanctuary candle products.